One of the questions I get asked most often is in regards to the camera equipment I shoot with. Over the years I have owned many different brands of cameras. I started photography with a Minolta film camera, then moved on to own other brands including Pentax, Olympus, Mamiya, Canon & Nikon. When I was shooting as a beginner and amateur, I constantly sought the guidance of those established pro photographers whom inspired me. I wanted to know what camera gear they used to capture their amazing images. I have put this page together to provide info and answers to frequent questions I get from people. In this blog post, you will get a chance to take a peek inside my camera bag to see what I carry with me. I have used Nikon cameras since 1980 after switching from a Canon system. At the time, I was using Nikon pro-film cameras such as the Nikon F4. Today, my current gear bag includes two camera bodies, a Nikon D3s and D4, both full-frame digital SLRs or DSLR. Among some of the lenses that I own, I have a Nikon 16mm f/2.8 fisheye which can be a fun lens to work with and one that sometimes use for northern lights photography. My choice of lenses covers a versatile focal length. My telephoto Nikkor 80-200mm f/2.8 is my 'go to' lens. It is a very nice lens, somewhat heavy but the image quality and ability to diffuse backgrounds make it an essential for my kit list. I absolutely love this lens! I keep this lens on my D3s camera body most of the time while shooting in Alaska. For me, the 80-200mm f/2.8 is a great all-round lens and covers many situations such as shooting from our vehicle to people portraits. I often use this telephoto zoom for scenics as you can isolate distant compositions, essential for landscapes and seascapes from a sightseeing vessel in the fjords. Sometimes I use my Nikon 17-35mm f/2.8 if I want a wider angle when working from vessels. This lens is capable of capturing pin-sharp images at very low shutter speeds, even when handheld. Lastly, I have a huge 300mm f/2.8 monster telephoto lens! This lens is amazing and the clarity is phenomenal. This is a hefty lens which requires a lot of respect, therefore I always use this with a tripod. I have used it handheld along with a Nikon 1.4 Teleconverter but you need to make sure you have high shutter speeds to maintain sharpness. I use this lens for most of my wildlife photography. With the teleconverter on, it gives me a total of 420mm without loosing any image quality. This converter is amazing and I have yet to see any image quality issues! I am convinced that sling straps are the way to go for me. They are easy to use, comfortable to wear, and are safer if you are climbing around to get a shot because the camera is less in the way. If you need to carry two cameras like I do, the Black Rapid Double is an excellent choice. From a purely material perspective, it is expensive for what it is, but it is not unreasonable for what it does which is make shooting faster, easier, and more effective while reducing muscle stress and physical fatigue. It kind of depends on your perspective, but for me it rates as one of my better gear buys. There is no better way to carry and shoot with two cameras in my opinion. The Black Rapid Double is great for shooting with two cameras using hand holdable lenses. For example, I put a 80-200mm on my Nikon D3s on one side and a 300mm F2.8 on my Nikon D4 on the other and loved the ease with which I could change cameras. Lower one and pick up the other; I can’t imagine anything quicker. For those days when you want to catch a sunset or the northern lights, you won’t want to be without your tripod. Traveling with a heavy, bulky tripod is no longer painful. I own a carbon fiber Manfrotto tripod with a Giotto ball head. My tripod has travelled thousands of miles and has seen all types of weather conditions. All my lenses and camera bodies are fitted with Kirk Enterprises quick-release plates. I've replaced the lens foot on my Nikkor 300mm and installed Kirk L-Brackets on both cameras which make it very easy to put on and take off the tripod and adds ease switching from horizontal to vertical mounting positions. I've recently invested in a Hahnel Giga T Pro II remote release which operates wired or wireless. This set up works well for northern lights photography or long exposure shots. This is a very handy addition to my gear. Very reliable. When away from the office, I use an Apple MacBook Pro 15" to review and edit images, storing them on LaCie 1TB Rugged firewire drives. I use a LaCie RAID hard drives to store my images. For image storage for my Nikon cameras while shooting, I use SanDisk 64Gb memory cards for the simple reason that I have never had an issue with them. Each of my Nikon cameras have dual memory card slots for a combined storage total of 128Gb each! When I get done for the day, I will edit all of the photos using Adobe Lightroom or Photoshop. Post image processing is part 2 of making a great photograph. For lighting, I use Nikon SB800 Speedlights and I also carry a Photoflex 20" reflector disc. For cleaning, I use lens cloths which are critical for dust, sand, and dirt that appear on your lenses. A “puffer style” blower will keep your mirrors and sensor spotless. I also carry several sizes of zip lock bags especially if I am heading off to a wet or rainy location. I like to keep a couple spare gallon sized zip lock bags to hold lenses and camera when you need to keep shooting in spite of the weather. I also use them to put my camera inside the bags to avoid condensation caused by moving camera from very cold temperatures to room temperature. I also carry a few filters with me such a ND 9-stop filter which I use for waterfalls or other cool effects; Circular polarzer filters and a few graduated filters. No tourist bags here. When you are traveling on a photographic journey, you need to protect your gear with something durable, water resistant, and maintain accessibility. After many years trying to find the right bag to carry all of my stuff, I found the F-stop bags. This is my bag of choice to transport my gear around when traveling and I have their Tilopa backpack. The main compartment has enough space for my Nikon D3s & D4 camera bodies, 80-200mm 2.8 lens, 24-70mm 2.8 lens, 16mm 2.8 lens, 300mm 2.8 lens, two Nikon Speedlights, and a 1Tb external hard drive. In the zipper top inside, I can keep my lens cloths and cleaner, my card reader, my extra CF cards and any other small items I may need. There are other pockets and webbing on the outside of this bag to carry a tripod, rain jacket or parka, etc. Finally, the there is a zipper compartment on the front of the bag where I can keep my iPad. I love this backpack not only because it holds all of my camera gear pictured here but the fact that it also fits perfectly in the overhead compartments of airplanes. Much of Alaska can turn quite frigid in the winter; summers there can best be described as generally comfortably warm, or on the cool side, but not cold. The largest number of visitors reach Alaska on cruise ships, often beginning and ending in Vancouver, BC., that travel the Inside Passage most of the way to Alaska. This route takes you through the chain of islands that stretch up the Pacific Coast of Canada and southern Alaska. experience, so availability can be limited. September is also a good time to visit Alaska. Fall comes early to Alaska and many of the trees are blazing yellow and red by early September. Combine the bright yellow colors of the aspen and willow trees with the blazing red tundra plants and you have the best fall colors experience Alaska has to offer. In Denali National Park, Polychrome Pass earns it name. As a backdrop, the tallest mountains, will have fresh snow on their peaks while the lower elevations are still dry. Wildlife search opportunities also improve in late season, as the larger mammals begin feeding in the lower elevations in an attempt to pack on as much winter weight as possible. During the summer months Alaska averages 19 hours of daylight in Anchorage, 22 in Fairbanks, and 18 in Southeast. But from early May through September, days are considerably longer than at lower latitudes. Alaska's sky is light nearly all night long from late May to late July. Alaska's summers are slightly rainier than the rest of the U.S. Alaska's summer temperatures are surprisingly pleasant. Daytime highs range from 60°F – 80°F. Nighttime lows are cool, dipping into the 40's – 50's. May and September are 5° – 10° cooler. So When's the Best Season to Visit Alaska? June 15 – July 15 as the best time to visit Alaska. But not everyone can visit during that month window, and that's no problem. Alaska weather is not predictable. You can come in August and bask in sunshine or in June and face driving rain plus strong winds. Alaskans have learned not to let weather interfere with their plans or mood. If the weather were better, it wouldn't stay Alaska for long; it would start to look more like Los Angeles. If you're worried about Alaska mosquitoes come the last week in July or first week in August. Night frost will have killed off a lot of the mosquitoes, but you will have to put up with chillier evenings. Many visitors to Alaska see the state from large cruise ships. While these ships allow people to “visit” Alaska, they don’t offer opportunities for any more then passive viewing from a distance. Land tours allows you enjoy Alaska in the way that you desire. With a land tour, instead of being forced to do what the cruise ship is doing, you can do what you want to do. Visiting Alaska can and should be a trip of a lifetime. The majestic waterways, mountains, glaciers and wildlife provide an ideal environment for sightseeing. Touring the Alaskan wilderness by land is one of the most rewarding and most unique experiences available. Large cruise ships and the cruises they embark on are not geared toward optimizing your experience, they are geared toward optimizing profits. The large cruise ships don’t have any regard for what you want to do on a particular day, or where you would like to go. They may attempt to ensure that you have a good time while on your cruise, but the large number of passengers hampers their ability to cater to those aboard. Many of the large cruise liners that cruise Alaska's waters carry over 3,000 passengers. Their immense size and huge number of passengers greatly reduces the Alaskan experience for visitors. Alaska's amazing wilderness should be experienced rather then merely passed through. Planet Earth Adventures keeps its groups small to keep that unique individuality and personal touch. We combine land tours with day cruises. We use smaller cruise boats that allows for travel into the most remote and inaccessible places in Alaska. So come to Alaska this summer . . . and Discover the Real Alaska with Us! The Anchorage Fur Rendezvous (Fur Rondy) - Truly Alaskan! Anchorage's annual Fur Rendezvous Winter Festival also known as the Fur Rondy has celebrated the start of spring in Alaska since 1937. The Fur Rondy Festival is a significant part of the history and tradition of Anchorage. The name "Fur Rendezvous" derives from swap meets at which fur trappers would gather to sell their winter harvests. In the early days of Anchorage, these swap meet usually took place in mid-February. Back then, Anchorage had a population of roughly 3,000 people and it was very isolated, so to bring the community together, resident Vern Johnson organized a three day sports tournament, called the Winter Sports Carnival, which was timed to coincide with the rendezvous. 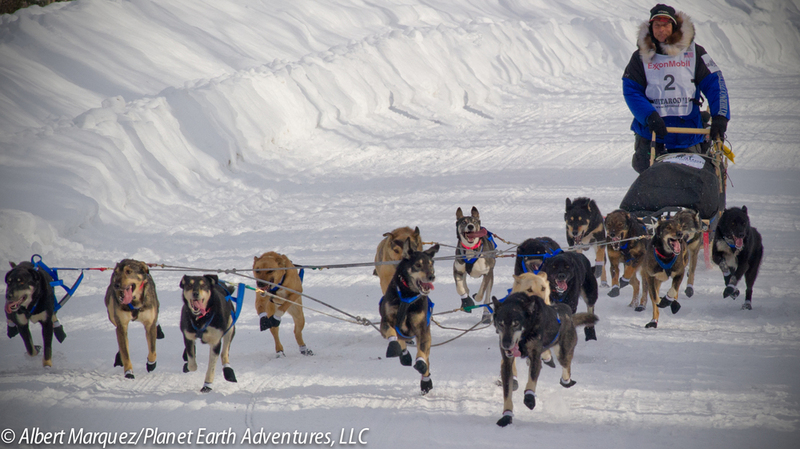 Now days, this annual event takes place at the end of February and ties in with the Iditarod. only in Alaska . . .
One of my favorite events, the Running of the Reindeer, which I consider to be a parody to the running of the bulls in Pamplona, Spain, has also been the crowd favorite since it began. On the first Saturday in March, after the Iditarod Ceremonial Start, several tame reindeer (called caribou in North America) are let loose along a two block section in the middle of downtown Anchorage, as costumed participants run with them in a mad dash to the finish line. Rondy Grand Prix - The Oldest Street Race in the U.S.
Official Fur Rondy Fur Auction - the descendant of the original fur trade rendezvous, present since the earliest days. Miners' and Trappers' Charity Ball. 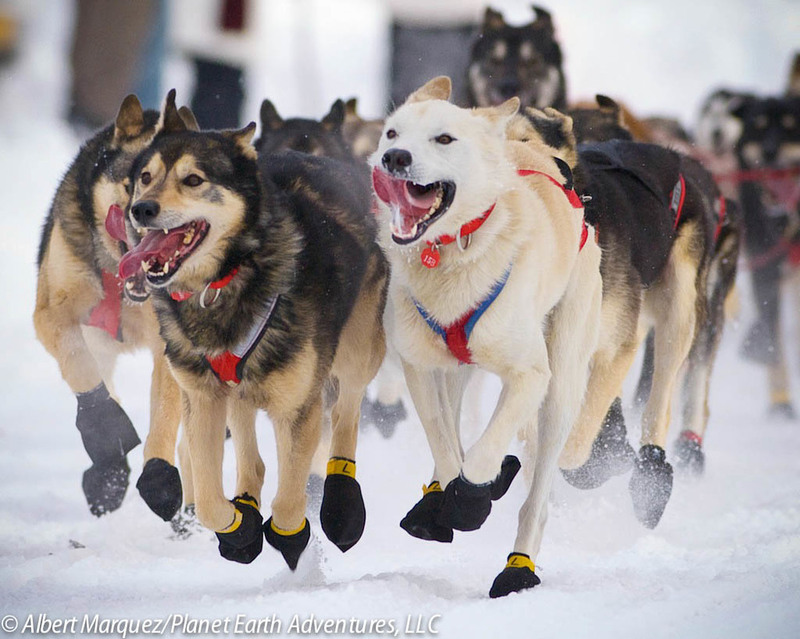 The World Championship Sled Dog Race debuted in 1946 and has become the cornerstone event of the Festival bringing teams of sled dogs and mushers to Anchorage from across Alaska and all over the world. Rondy on Ice - figure skating show. This 10 day annual event has something for everyone, from contests and culture, sled dog races and snow sculptures, fur auctions and fireworks. Don't miss the Running of the Reindeer, the Miners & Trappers Charity Ball, the Native Arts Market. If you happen to be visiting us during this time of year, make sure to stop and visit the Rondy Shop at 4th & D in downtown Anchorage, Alaska. PHOTOS: COPYRIGHT © 2014 ALBERT MARQUEZ/PLANET EARTH ADVENTURES, LLC. Right now, there’s huge excitement among those of us who hunt for the aurora borealis, also called the northern lights. The lights are historically at their most frequent and spectacular when the sun reaches the peak of its 11-year cycle of activity. This peak is known as Solar Maximum, and NASA is predicting it for the autumn of 2013. NASA’s prediction is based in part on the number of sunspots originating on our star’s surface and, as the name would suggest, Solar Maximum is when the frequency of sunspots peaks. Senior NASA scientists have predicted that the current period of solar maximum activity will reach a new peak in December affording travelers to the far north the best possible conditions for seeing the Northern Lights in the next decade. The intensity and frequency of Northern Lights activity is governed by a solar cycle that lasts for 11 years and the point of a “solar flip” is the one at which the conditions for viewing the lights (also known as the aurora borealis) would be at their best. The current period of solar maximum activity has already had one peak – towards the end of 2011 to early 2012 and for the past two winters there have been reports of spectacular sightings involving the full range of colors associated with the phenomenon. With the second peak now coming at the end of this year, strong sightings are set to continue this winter and into the winter of 2014-2015. All of this is great news for travelers who are planning to travel to Northern Lights destinations as the experts have now accurately predicted the peak of the most intense period of activity for the next 11 years. With scientists now putting a date to the peak of the solar max, there is no better time to visit our top northern lights destinations and we are seeing a huge increase in the number of people contacting us that want to get a glimpse of this incredible phenomenon. Viewings of the northern lights are never guaranteed even at times of a solar maximum as cloud cover inevitably prevent you from seeing the show. We suggest that you allow yourself at least 3-4 days dedicated for northern lights viewing. The longer you allow yourself in the aurora borealis region, the greater your chances of a viewing. 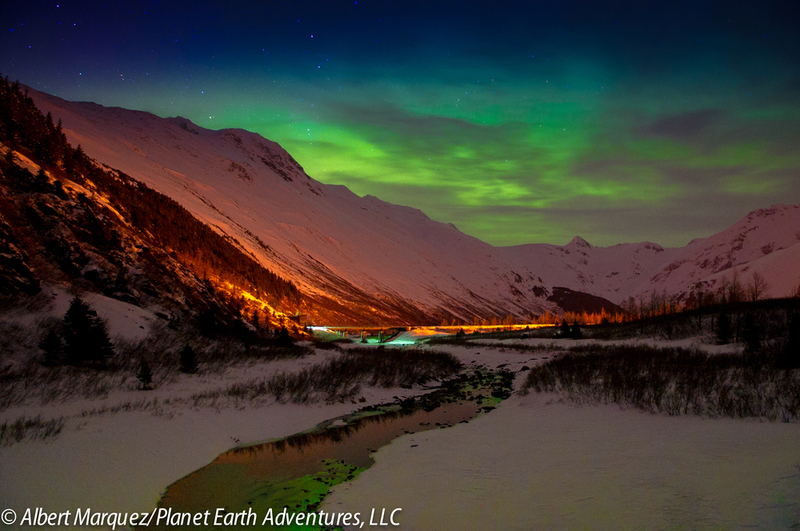 Planet Earth Adventures is an Alaska travel company that specializes in tours to view the aurora. In Alaska, we recommend Fairbanks as the ultimate place to see the lights. Located about 359 miles north of the Anchorage, Fairbanks is located under the aurora oval. Some good spots for lights-viewings as both are behind the University of Alaska near Ester & Murphy Domes; Cleary Summit and Chena Hot Springs which are all located away from any detracting artificial lights. Many companies offering northern lights tours have recorded a surge in demand for trips during the period of solar maximum and many have expanded their itineraries. Displays of the Northern Lights occur when solar particles enter the Earth’s atmosphere and on impact emit burning gases that produce different colored lights (oxygen produces green and yellow; nitrogen blue). The scientific term for the lights is the aurora borealis (named after the Roman goddess of the dawn). A similar spectacle in the southern hemisphere is known as the aurora australis. The aurora borealis occurs in an oval shaped area located above the magnetic pole. The best sightings are within the “aurora oval” (rather than at the pole itself), and away from artificial light and moonlight. Displays are governed by an 11 year cycle and are at their most dramatic during times of high solar activity, such as now, but sightings can be recorded at any time. It is impossible to guarantee a viewing even during a period of solar maximum but if the sky is cloudy, the lights will be concealed. For more information about Northern Lights Tours, call us at (907) 717-9666 or click the link below.